The Sirens are amongst the most famous characters from Greek mythology, for their encounters with Greek heroes really is the stuff of legends. These mythological figures are of course known for the “Song of the Sirens”, the melodies that would lure the unwary mariner to their deaths. The sea, and water in its entirety, was important to the ancient Greece, and every as aspect of it had a deity associated with it. In terms of the sea, there were powerful gods like Poseidon, and minor deities like the generally beneficial Nereids. The sea of course posed plenty of dangers to the Ancient Greeks as well though, and these dangers were also personified, with the likes of the Gorgons, the Graeae and the Sirens just some of these personifications. In the beginning though, the Sirens were not connected to the sea for they were initially classed as Naiads, freshwater nymphs, with the Sirens being the daughters of the Potamoi (river god) Achelous. Various ancient sources name differing mothers for the Sirens, and some would claim that the Sirens in Greek mythology were born to a Muse, either Melpomene, Calliope or Terpsichore, or to Gaia, or to Sterope, the daughter of Porthaon. It could of course be argued that the first three names of Sirens given all refer to the same nymph. Hesiod, in Catalogues of Women, named the Sirens as Aglaophonus, Molpe and Thelxinoe (or Thelxiope), whilst in the Bibilotheca (Pseudo-Apollodorus), the names given were Aglaope, Peisinoe and Thelxipea. The role of the Sirens though would change when Persephone went missing. Although, initially unknown, the reason as to why Persephone was missing was because Hades, the Greek god of the Underworld, had abducted the goddess, in order that Persephone should become his wife. In the romantic version of the story of the Sirens, Demeter would subsequently provide the Sirens with wings in order that they could aide her in the search for Persephone. Thus the Sirens were still beautiful nymphs, just with wings that enabled them to fly. Other versions of the Sirens myth though has Demeter angry about the attendants of Persephone’s failure to prevent the disappearance of her daughter, thus when transformed, the Sirens become ugly bird-women. Some of the ancient stories that refer to the Sirens would claim that the nymphs would subsequently lose their wings. The Sirens would compete against the Younger Muses to find out which group of minor Greek goddesses had the most beautiful voices, and when the Muses bested the Sirens, the Muses would then pluck out the feathers of the Sirens. Those ancient sources that did provide a description of the Sirens though were in a quandary, the same stories also told that following the disappearance of Persephone, no mortal ever saw a Siren and lived afterwards, making it impossible for a chronicler to give a first-hand description of a Siren. Persephone was of course eventually located in the realm of Hades, for half the year the daughter of Demeter was scheduled to remain in the Underworld. Persephone was therefore not in need of attendants or playmates, and so the Sirens were given a new role. Some ancient Greek sources tell of Zeus giving the Sirens the island of Anthemoessa as a new home, although later Roman writers would instead have the nymphs living upon the three rocky islands called Sirenum scopuli. There is no definitive location for either Anthemoessa or Sirenum scopuli; with the former sometimes said to be the island of Capri or the island of Ischia, and the later said to be the Capo Peloro, or the Sirenuse or Gallos Islands. ​The lack of clarity is perhaps due to the descriptions of the home of the Sirens offered up in antiquity, for the only identifying features were said to be sheer cliffs and hidden rocks. 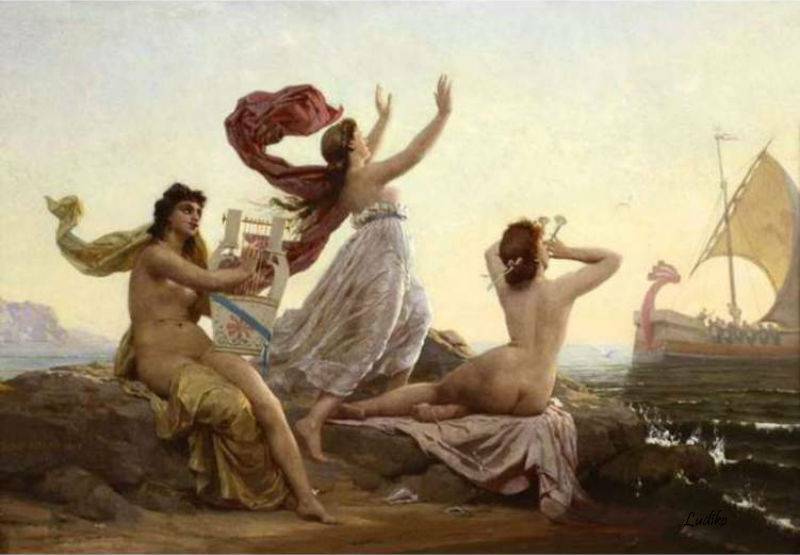 The Song of the Sirens was said to be sufficiently beautiful to have mariners drowning themselves, or dashing their vessels upon the rocks, in order that they could get closer to the source of the beautiful song. It is perhaps surprising that despite the apparent fame of the Sirens, these nymphs only appeared in two major tales from Greek mythology. On both occasions the Sirens were encountered by noted Greek heroes, with first Jason, and the Odysseus passing the home of the Sirens. Jason is of course captain of the Argo, and he and the other Argonauts encounter the Sirens during the quest to bring the Golden Fleece to Iolcus. The Argonaut knew about the dangers posed by the Song of the Sirens, but amongst the Argonauts was Orpheus. The legendary musician was instructed to play as the Argo passed by the Sirens, and effectively this music drowned out the Song of the Sirens. One of the Argonauts though still heard the Sirens sing, and so before he could be stopped, Butes had thrown himself from the Argo in order to get closer to the Sirens. Before Butes could be drowned though, the goddess Aphrodite had rescued him and transported him to Sicily, where Butes became the goddess’ lover, and father to one of her sons, Eryx. Odysseus would also have to sail pass the home of the Sirens as he, and his surviving men, attempt the return journey from Troy to Ithaca. ​The Sorceress Circe had already warned her lover Odysseus about he could circumvent the dangers of the Sirens, and so as the vessel neared the island of the Sirens, Odysseus had his men block their ears up with wax. Odyssey then had himself tied to the mainmast of the ship so that he might hear the Song of the Sirens; Odysseus though told his men not to release him from his bindings until they were well clear of the danger. Thus the ship of Odysseus successfully bypassed the danger of the Sirens. The Death of the Sirens? The common version of the Siren myth has the Sirens committing suicide after Odysseus had successfully passed by; this was due to a prophecy that stated if anyone heard the Song of the Sirens and lived, then the Sirens would perish instead. This though ignores the fact that Butes had already heard the Song of the Sirens and survived a generation before Odysseus encountered the Sirens. 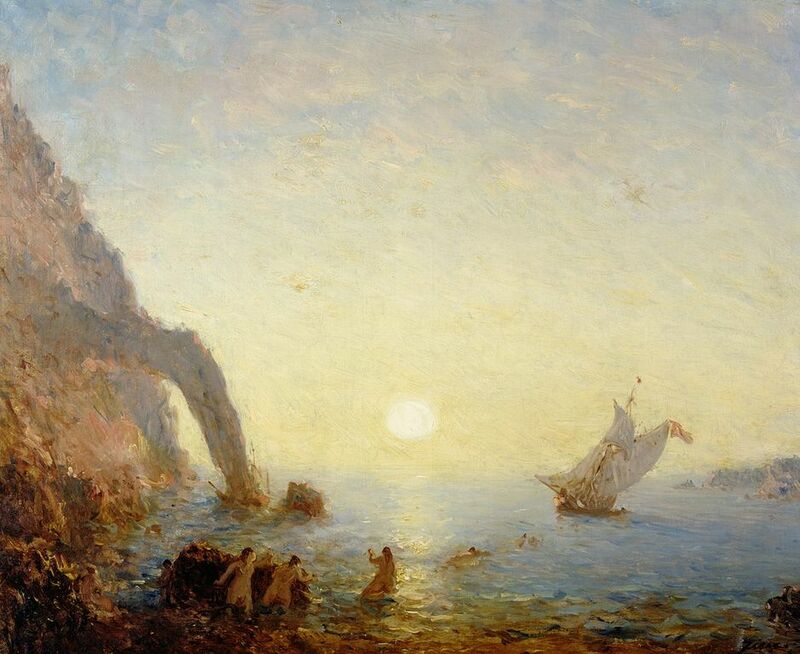 Thus a few writers have the Sirens living on after the encounter with Odysseus, and indeed in one tale they even have their revenge upon the Greek hero, for Telemachus, the son of Odysseus, was said to have been killed by the nymphs when they found out who his father was.